If we talk about high humidity in our living spaces then basements hit the top of the list. Lack of ventilation and sunlight are the major causes of high humidity in the basements in Saudi Arabia or KSA, which eventually triggers in the formation of molds and mildews. Such formations can damage the metal and wooden structures that fall in range of the humid air. Nothing but a Basement Dehumidifier may solve the issue of high humidity in places like these. But prior to selecting the perfect model, it is recommended that you should review your basic requirements thoroughly. 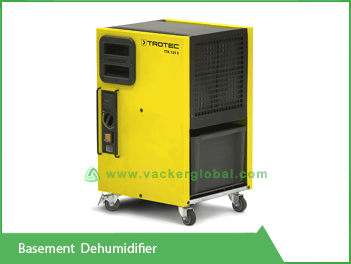 Vacker Saudi Arabia or KSA provides various Dehumidifiers to regions or areas such as Dammam, Riyadh, Al Khobar, Jeddah, etc. This piece of writing can assist you in choosing the right basement dehumidifier. We know that the density of moist air is more than that of moist free air thus the humid air would generally settle down. This air can easily find its way to basements if there are any. Though basements are generally used as stores, anything that has been stored in it can suffer a negative impact because of the humidity that tends to be higher in the basements. Neither sufficient sunlight nor ample fresh air makes way to the basement triggering the rise in humidity level. Thus basements in Saudi Arabia or KSA, are critical places where a Basement Dehumidifier is of must. As a first sign of the impact of humidity, musty smell or a feel of damp air can be felt. On the secondary stage, the impact of humidity becomes more tangible than just being felt. It starts to show its impact on the goods and it seeks immediate cure otherwise the damage can be irrevocable. Hence a wise person will install a Basement Dehumidifier even before the first signs of damage. 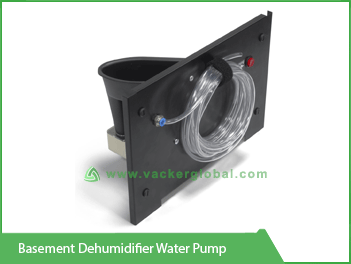 Saudi Arabia or KSA has a tremendous market in range of Dehumidifiers and we at Vacker Saudi Arabia or KSA have a wide range to offer to regions or areas like Jeddah, Al Khobar, Dammam, Jeddah, etc. But for the basements, a heavy duty model is considered best. Hence, Basement Dehumidifiers are used and have their own distinct category. There is a provision of an external or inbuilt pump, which is used to pump water to a higher level, in an effective Basement Dehumidifier. It drains the water when the container of the machine is filled up. This drained water can be used in your garden. If the basement is of high capacity then so needs to be your dehumidifier. It is recommended that you need not always go the cheapest one because the cheapest one may not meet your goals. 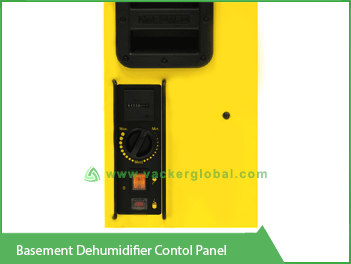 Vacker Saudi Arabia or KSA has the provision of a free Dehumidification Capacity Calculator so that you can know which model of Dehumidifier is best fit for you. You need to input some of your actual parameters in the calculator and the result will help you choose the right model for you. Whichever model of Basement Dehumidifier you might select, the model must have a hygrostat (or humidistat). The function of which is to function automatically to shut down or start the dehumidifier depending upon the current and desired humidity levels. An additional water pump can also be fitted to the machine so that the water collected in the container can be pumped to a higher level from the basement. All the functionality can ascertain that the dehumidifier can operate automatically without any manual intervention. It has the capacity to remove 28 liters of water per day at a surrounding temperature of 30°C and a humidity level of 80% RH. It has a capacity to remove 11 liters of water per day at a surrounding temperature of 20°C and a humidity level of 80% RH. 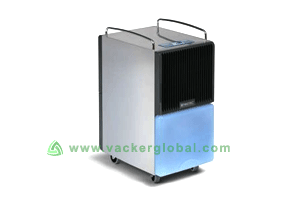 It has a maximum dehumidification capacity of 32 liters per day. It is best suitable for a maximum space of 300 cubic meters. If the minimum temperature of the surrounding is 5°C. If the maximum temperature of the surrounding is 32°C. If the minimum humidity of the surrounding is 32 % RH. If the maximum humidity of the surrounding is 100 % RH. The input voltage is 230 V AC. The frequency is 50 Hz. It consumes a maximum power of 0.56 kW. It consumes a nominal current of 2.5 Ampere.